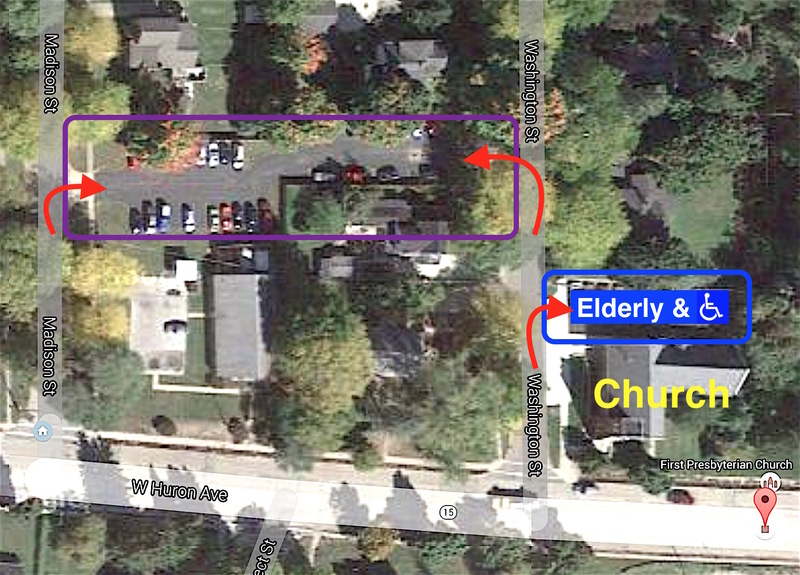 The church’s address is on Huron Ave, but you will want to turn up Washington Street, just to the left of the church. Parking (click here for a pic): The small lot behind our building is reserved for those with mobility limitations or handicaps (3 handicap spaces, 2 van-accessible). The main lot is just a bit farther up Washington Street on the left. If you need “valet service,” we have folks ready to attend to your needs. The main entrance to the church is off of the rear parking lot. Restrooms: There are 3 public unisex restrooms: one upstairs just inside the main doors, and 2 downstairs in the hallway. We have a safe, secure, and clean nursery for infants and toddlers. Please see our Nursery & Children Page if you plan to utilize our nursery. The church has a small elevator for those with mobility limitations. Our service begins at 10:00am and usually runs until about 11:15am. On a Sunday where something “extra” is happening, service may run a bit longer. Everything you need for worship is in our bulletin and on our video screen, and the worship leader or pastor will prompt you verbally for service transitions. Please see our Worship Aids Page for a heads up on common worship elements we use. Lastly, please know visitors are welcome, but not expected, to donate when the offering plate is passed. We are just glad you chose to worship with us, and hope that God ministers to you during your time here. If you do wish to give, we invite you to visit our Give page for more information.